Over the last decade we as a society have begun to place a premium on health – which is obviously a very good thing. By actually prioritising our health we not only stave off unwanted disease and illness, but also increase our ability to function on a day to day basis. Not to mention that fact that we also increase our likelihood of living a long, happy, and disease-free life. With this prioritisation of health has come an investment into an abundance of natural and organic products that actually have the capacity to improve health in a very big way. These foods are thought to not only contain key vitamins and minerals that are required to maintaining normal function, but also contain many additional compounds that interact with the body at a cellular level to enhance global health. And one product that has been making a huge splash within the health industry of late is red yeast rice. In the simplest sense, red yeast rice is a specific type of fermented food. 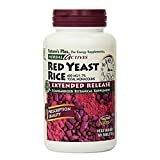 You see, red yeast rice is created by combining white rice with a unique strain of yeast, known as Monascus purpureus. Once combined with this particular yeast, the rice begins to ferment, in which it turns bright red in colour – and this final product is our red yeast rice. During this fermentation process, numerous health positive compounds are created. These specific compounds are said to help lower blood cholesterol and blood pressure, while also reducing inflammation. Now while this amazing rice has been a dietary staple in Asian countries for the better part of a millennia, it has recently become extremely popular here in the western world where it is frequently taken in supplement form. In this manner, key extracts derived from the red yeast rice (known as red yeast rice extract, or RYRE) is used to create an extremely potent red yeast rice supplement. This supplement contains all the potent health boosting compounds found within red yeast rice, albeit in much higher doses. 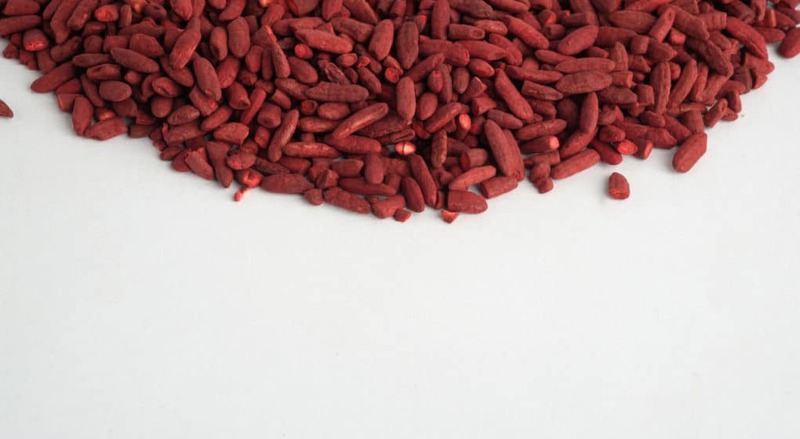 What are the Benefits of Red Yeast Rice Supplements? As previously mentioned, red yeast rice supplements have become extremely popular of late. With this in mind, we wanted to take an objective look at the health research surrounding this unique and interesting product to determine how effective it truly is. Does Red Yeast Rice Help Cholesterol? One of the key compounds produced during the fermentation process that gives red yeast rice its health boosting qualities has actually been shown to slow the action of key enzyme within the human body that is responsible for producing cholesterol. With this in mind, the daily consumption of red yeast rice supplements has been shown to cause significant reductions in the levels of LDL cholesterol (also known as ‘bad’ cholesterol) found within the blood, while also causing reductions in total blood cholesterol . Does Red Yeast Rice Improve Heart Health? In conjunction with its extremely positive influence on blood cholesterol levels, the consumption of red yeast rice supplements has also been demonstrated to have a positive effect on the heart. You see, certain compounds found within this unique supplement have been shown to improve artery and vein health, reducing their stiffness . This can lead to reduced blood pressure, improved cardiovascular health, and a reduced risk of heart disease and stroke. Does Red Yeast Rice Help Fight Obesity? While the exact mechanism remains unclear, it appears that supplementing with red yeast rice can prevent weight gain in times of high caloric intake , while simultaneously improving the body’s sensitivity to the hormone insulin . 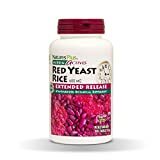 Through a combination of these two factors, red yeast rice supplements appear to have the ability to prevent weight gain and even promote weight loss. Additionally, they are also extremely likely to have a positive impact on metabolic health, reducing the risk of developing diseases such as diabetes. Does Red Yeast Rice Reduce Inflammation? Each and every day the body is exposed to stress. This stress can come from a variety of sources, including certain chemicals within our food and water, from lifestyle and work-related factors, and even from environmental mutagens, such as UV rays from the sun. This stress leads to an inflammatory response, which when prolonged, can lead to cell damage and a rapid decline in health and function. This increased inflammation has also been suggested to increase our risk of cancer, cardiovascular disease, and diabetes. Interestingly, many of the active compounds found within red yeast rice supplements have been shown to reduce inflammation throughout the body, improving health as a result . Given the potent health benefits associated with the consumption of red yeast rice supplements, we wanted to give you some great options that you can implement into your health regime immediately. 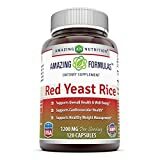 This red yeast rice supplement by Amazing Nutrition is one of the most popular on the market at the moment – and for very good reason too. Providing a potent dosage of 1200mg per serve, this is one of the more powerful options available, giving you everything you need to boost health quickly and efficiently. Jarrow Formula have long been a favourite of ours for a very long time, as they frequently put out great quality products that have scientific evidence to support the compounds they contain. With all this in mind, their red yeast rice supplement is a great choice. Providing an extremely potent dosage of 1200mg red yeast rice extract per serve, you really can’t go wrong here. Natures plus have built an excellent reputation upon their high-quality supplements that are renowned for being extremely effective. This option provides a scientifically supported dose of 600mg of slow-release red yeast rice extract in a single capsule. While this is one of the more expensive options on the market, you shouldn’t let that act as a deterrent as you can be assured of its quality and effectiveness. Red yeast rice supplements are on of the most potent organic health boosters on the planet at the moment. With the ability to improve blood cholesterol, enhance heart and metabolic health, promote weight loss, and even fight inflammation, it truly impacts health positively across the entirety of the body. If you have had any experience using red yeast rice supplements in the past then we would love to hear about it, so drop us a comment and we will get back to you ASAP.